Personal Financial Literacy is required by the new Texas math standards. 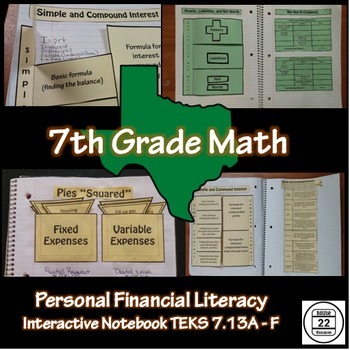 This is a personal financial literacy bundle designed for the 7th grade and interactive notebooks. 7.13A: Calculating Sales Tax and Income Tax. There are two activities each for 7.13A, 7,13C, 7.13E, and 7.13F - one for note-taking and one interactive activity. There are three activities for 7.13B - one for note-taking and two interactive activities. There is one activity for 7.13D. It also includes instructions with images, know goals, and answer guides. Each purchase of this personal financial literacy bundle is for individual use only. The individual licensee can make copies for classroom use only.